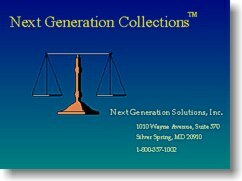 We are the authors of Next Generation Collections used by the legal profession involved in debt collection work. Our system complies with and provides an on-line business-to-business interface with the National Attorney Network for assigning debt collection cases on a national basis. Contact us for more details of our capabilities regarding debt collection and other legal case management automation. We have over 15 years experience in development of custom software for the legal profession.